Proudly serving Duluth, Hermantown, Proctor, & Superior, WI. 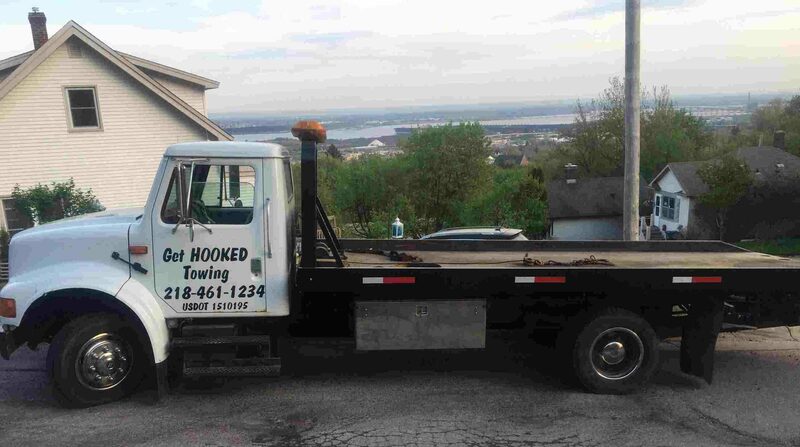 The team at Get Hooked Towing LLC in Duluth, MN goes the extra mile for our customers. We guarantee if you use us once you will be Hooked! We understand that vehicles break down in dangerous situations, no one wants to be in that situation. Our highly trained team works to ensure your safety. We will quickly get your vehicle out of the roadway. We have been in business since 2017 and have made over 10 service calls per day! Almost 2500K safe happy customers since we began! We understand that in a towing service industry, quality and safety comes first, We also recognize that we are in an emergency-based business, where expedient service is necessary to resolve a breakdown. Often times we get asked if it is “worth it” the answer is YES! Our experienced customer service team, drivers, and technicians sleep better at night knowing our efforts keep you and your family safe. Our tow truck professionals are insured and licensed in order to make sure that your vehicles are delivered safely and effectively. We offer a variety of Roadside Assistance Service in Duluth MN, and the surrounding area! If you don’t see what you need below please contact us!